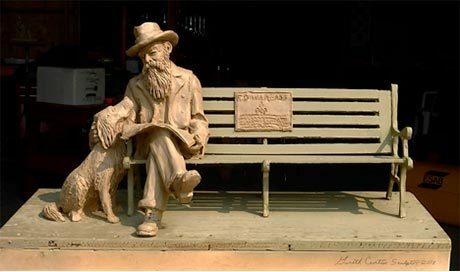 Northwest artist Gareth Curtiss is bringing his bronze sculpting project to Friday Harbor December 17th through 21st so that the public may share in the creation of the Ed Warbass sculpture he is making for the town. The public is invited to watch and interact with the artist in a temporary work space being created for him in the glass atrium at the front of San Juan Islands Museum of Art (SJIMA). Curtiss will demonstrate the clay sculpting process that precedes mold-making and bronze casting. 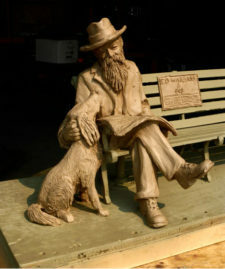 He intends to work on the bust for the life-size statue which will depict town founder Captain Edward D. Warbass sitting on a park bench with his dog, Bob, by his side. The sculpture will be installed on First Street at the entrance to Sunshine Alley by fall 2019. A clay maquette of the sculpture is available for public viewing at Town Hall. The museum’s Atrium Gallery will be open from 11 am to 5 pm throughout that week for viewing the sculpting process. No admission will be charged. Visitors will also be able to watch a 2016 episode of PBS’s “Common Ground” featuring Curtiss demonstrating the bronze sculpting process—start to finish—while creating a statue of Chief Bemidji for the city of Bemidji, Minnesota. Curtiss was selected from several professional bronze artists who responded to the Town’s 2017 request for sculpture proposals. In his 30 years as a professional sculptor, Curtis has completed close to 50 pieces that are displayed throughout the country. Samples of his work may be viewed on his website at http://www.garethcurtiss.com/. Ed Warbass is one of three men credited with founding the town. He was instrumental in breaking San Juan County away from Whatcom County and making Friday Harbor its county seat. The art site was selected to highlight an entrance to Sunshine Alley as part of the Town’s Sunshine Alley Design Plan. This is the third major art project involving the Friday Harbor Arts Commission since its formation in 2015. Previous projects include the Sunken Park mural, “Witness the Beauty,” and Tom Small’s stone benches in Breezeway Park.